That’s the last line of Grandaddy’s Highway, but it could just as easily be the first. As a little girl’s grandfather tucks her in bed at night, they watch the headlights of a passing truck cast light across her bedroom wall. 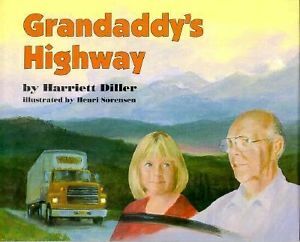 But then the narrating little girl says, “We are headed as far west as you can go on 30 West.” When you turn the page, she and her grandfather are together in the truck’s cab — and he’s even honking its horn. The girl’s vivid imagination also serves another function, since it helps readers remember the (real) cities along the route of the famous highway. U.S. Route 30 includes much of the famous Lincoln Highway, the first single road that crossed all of America, according to Wikipedia. But even if you’re not trying to memorize its route, the book is educational in another way. Their trip travels from the east coast to the west coast of America — and it takes in many of the geographical landmarks you’d see along the way. In the story, the girl and her grandfather pass through Chicago, and then approach the Mississippi River. (“Mist and river coolness rise from the brown water.”) There’s a beautiful drawing of the wide river at sunrise. And since Grandaddy needs a nap, he lets the little girl drive the truck. Even if it is an imaginary trip, it looks like a wonderful bonding experience. They share a cup of coffee in a Nebraska diner that’s “lit up like a lightning bug in the hot night.” Grandpa lights a cigar as they ride past a Wyoming lake, and they point their truck towards the Rocky Mountains. And as the altitude gets higher, the little girl confesses that all the beautiful sights have been giving her goosebumps. There’s “The glow of town from the other side of a hill. The rattle of a train rushing off to who-knows-where.